I’ve had several people tell me that their favorite character of the Charmed Pie Shoppe mysteries is Ella Mae LeFaye’s Aunt Dee. When I ask why, they inevitably share a story about a beloved pet who’s crossed over the Rainbow Bridge. You see, like all the LeFaye women, Dee possesses magical abilities. She creates metal sculptures of animals that have passed away using photographs provided by the pet’s owners. But she uses her magic to instill a glimmer of real life in the sculptures. When the owners look at them, they can still sense their pet’s presence and they feel comfort and a strong sense of peace. 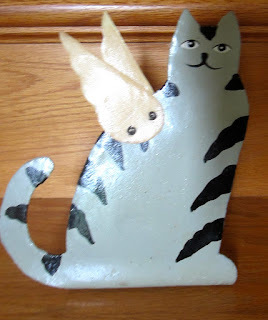 The idea for Dee’s gift came from a real-life woman who made dog and kitty angels out of sheet metal. Many years ago, I lost a cat to old age. His end wasn’t a surprise, but we’d been together for 17 years and I had a really hard time getting accustomed to not having him at the foot of my bed or waiting for me in the kitchen in the morning. Griffin was a grey tabby and a brilliant cat and I was so used to his company that my house felt empty without him. Not long after I said good-bye, I went to a craft fair and saw this kitty angel. It spoke to me. I brought it home and placed it where I could look at it every day. I talked to it as if it were my precious cat. Of course, it wasn’t, but it helped me heal. Without a mourning process, it’s hard to move on. Very few of us have funerals for our pets or even have the chance to bury them—and these are acts that help people obtain closure. Without them, it’s even more difficult to accept what’s happened. So I wanted my fictional character, Dee, to help people come to terms with their loss and to focus on celebrating the happiness they’d shared with their pets. I guess she resonates with readers who have loved an animal truly and deeply and know the heartbreak of having to say good-bye. I hope you all have many, many years with your furry, feathered, or scaly family members and that you will always hold tight to the magical memories you created together. 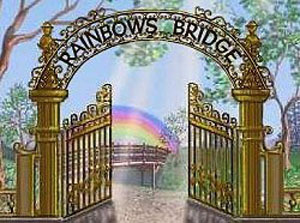 I have two dogs waiting at the rainbow bridge for me. It's still hard to think of Phoebe, especially since she was so young when she left. Jass, on the other hand had lived a long and loving life. She helped me raise Nat until she was in 5th grade and had protected me from anyone who entered my personal space. (She weighted all of 5 pounds soaking wet). The night Jass passed, I wasn't home but I woke to her bark around 3 in the morning. The next morning my friend who was taking care of her called and said she had left this world. I still believe in my heart that it was Jass I heard saying I'll wait at the Rainbow Bridge for you. Aw, that post really touched my heart! It was sooo hard to even think about another pup after having Zaya for 16 years but after 2 years I was just really "considering it" when Max came along and sooo happy I opened up my heart again to little Max! Great post! The mom has a crowd of animals waiting for her at the bridge. She thinks you never really get over losing a pet, it just hurts with less frequency given enough time. Of course, each is unique, so no animal can ever take the place of one who is gone. But then, that is part of their charm. And thanks for coming to my party! We had a blast!